G’day! This is Shiori Kubo from JPCERT/CC, serving as a member of the APCERT Secretariat. Today I would like to cover APCERT’s 10th anniversary, commemorated at the APCERT AGM & Conference 2013, held on 23rd - 27th March 2013 in Brisbane, Australia, very warmly and successfully hosted by CERT Australia. 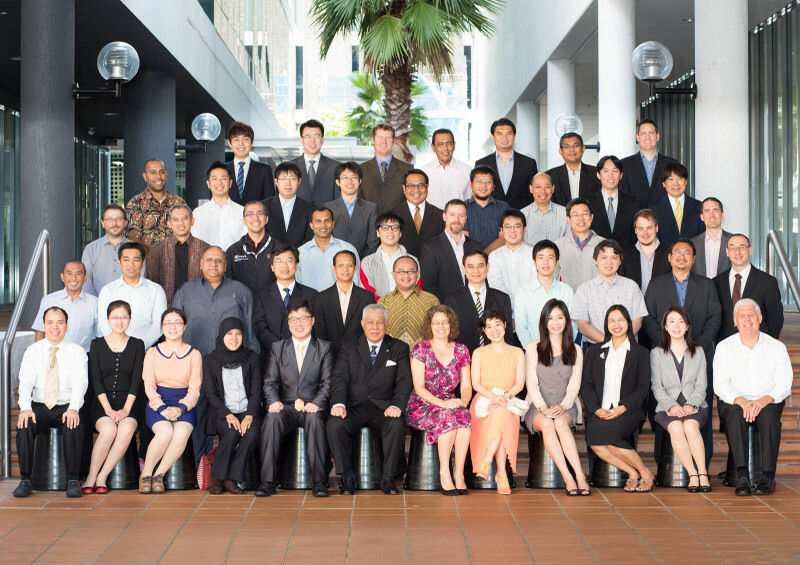 For readers who are not familiar with APCERT, please let me briefly introduce – APCERT stands for Asia Pacific Computer Emergency Response Team, and as the name implies, it is a forum of CSIRTs/CERTs in the Asia Pacific region, currently consisting of 20 teams from 30 economies. APCERT maintains a trusted contact of computer security experts in the Asia Pacific region to improve the region’s awareness and competency in relation to computer security incidents. The dawn of APCERT traces back to the late 1990s, when a vision was developed by the leading CSIRTs/CERTs in the Asia Pacific to establish a regional forum for cross border cooperation and Internet security incident handling. In March 2002, JPCERT/CC hosted the Asia Pacific Security Incident Response Coordination Conference (APSIRC) in Tokyo, aiming to improve working relationships among the CSIRTs/CERTs in the region. A key outcome was the decision to form APCERT as the vehicle for regional cross border cooperation and information sharing in mitigating cyber threats. In February 2003, all this becomes a reality – and APCERT was established consisting of 15 teams from 12 economies. Since then, APCERT has steadily broadened its membership and activities as represented by its annual cyber security drills, annual events (AGM & Conference) and outreach to various international and regional meetings. For further information, please visit the APCERT website. This was the theme of the 10th anniversary milestone event in Brisbane. During the past decade, the rapid development of the Internet has dramatically changed our surroundings and has increased our dependency on the Internet as seen in various business, government and critical infrastructure services online. Along this change, cyber attacks have also increased in frequency, sophistication and scale. Accordingly, Internet security has become a key issue to protect the economic and political stability of a nation and within the region. APCERT has taken a collaborative approach to fight against this growing threat, and will continue to strengthen its information sharing framework and incident response capabilities. JPCERT/CC has had the privilege of serving as a Steering Committee member and Secretariat since APCERT’s establishment. Furthermore, JPCERT/CC currently serves as the APCERT Chair and takes a lead role in developing outreach activities in particular. Our commitment requires hard work, but we enjoy the chance to take part in leading and supporting the operations and directions of APCERT. 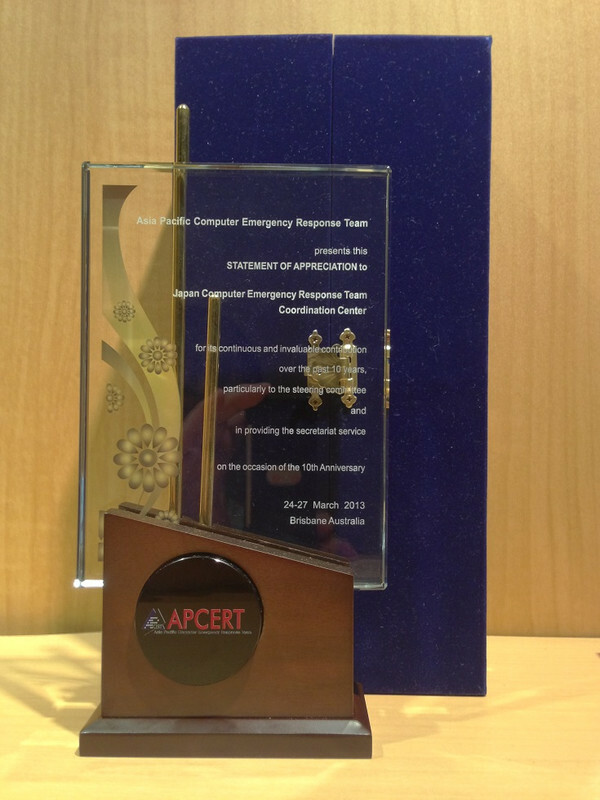 And to our pleasant surprise, JPCERT/CC was awarded by APCERT during the APCERT AGM & Conference 2013 event for our contribution. The beautiful crystal plaque was generously prepared and presented by KrCERT/CC. I feel that the expertise that exists in each Team, and the trust relationship and friendship that reside among us, all brings our working experience a very inspiring one. I personally learn much from working in APCERT too, and this time I learned a new word from our host, CERT Australia – “Wheels Up party.” When an event is over and the visitors takeoff home on the plane (wheels up), the host throws a Wheels Up party for the “job well done!” So, as a final note, I would like to thank and wish CERT Australia a big Wheels Up party, and also a Wheels Up party to all APCERT members on this 10th anniversary milestone – and sincerely look forward to our continuous journey on board APCERT!